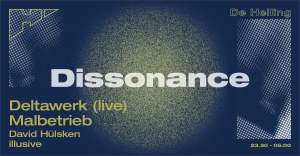 Club event and podcast series Dissonance represents the deeper spectrum of electronic music. Primary focus of the event is on live performances by renowned artists. The event is hosted by Dissonance founder illusive and fellow resident David Hülsken. The first edition of Dissonance will be on Friday the 13th of October in venue De Helling in Utrecht. Deltawerk will be performing live, including their own stunning visuals. Malbetrieb, of Paradigm fame, wil be joining the Dissonance family for the night. In the lobby we’ll have Steffie Ditzel, John MacKaay and Daan de Boer (aka MDA) bringing their own distinctive flow to the decks. You can get your tickets here.